A non-intimidating Paleo Pumpkin Mousse! Mousse is a very scary word indeed. It usually refers to a recipe which takes up to two pages in a cookbook and requires a dozen steps including whipping, folding and setting. Like I said, I’m all for complicated kitchen endeavors when the time is right… but usually I want to make simple things. And my relationship with traditional mousse is further strained because it calls for sugar and cream, two things I cannot eat right now on an anti-inflammatory, grain free diet. 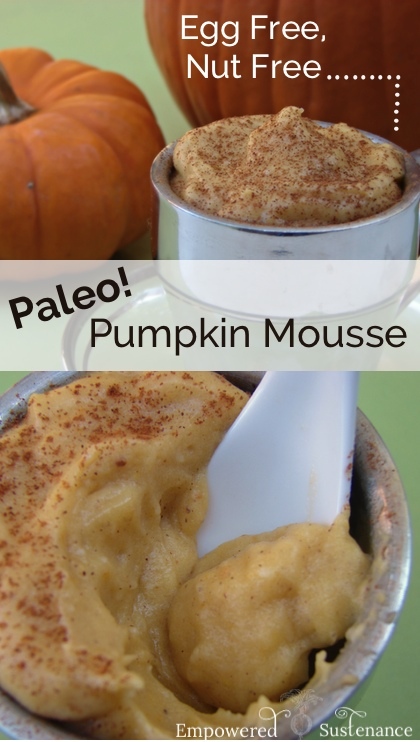 And that is where this Paleo Pumpkin Mousse comes in! For a thick, luscious result without eggs or dairy, I set coconut milk and pumpkin purée with gelatin. After is has set, I whiz it in a food processor and it transforms into a decadent and paleo-friendly mousse. In a small bowl, mix together the gelatin and ¼ cup of the coconut milk. This makes the gelatin dissolve without clumps later. Bring the remaining ¾ cup coconut milk to a simmer in a small sauce pan. Turn off the heat and whisk in the gelatin mixture until dissolved. Whisk in the pumpkin puree. Chill until set, at least 4 hours. 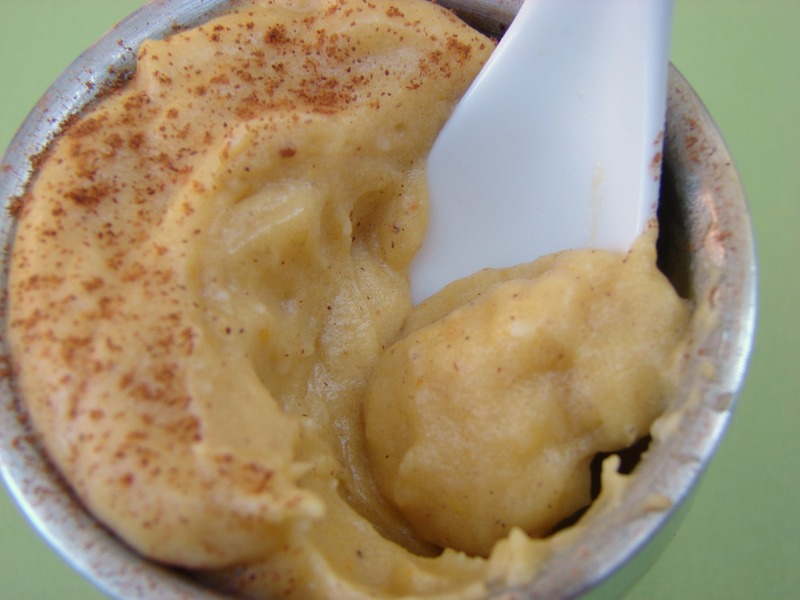 In a food processor, blend the set coconut milk/pumpkin with the vanilla, cinnamon and honey. It will appear to be clumpy, but keep blending and it will become smooth, creamy, and thick. Taste and adjust honey. This is best served right after whipping. You can store it in the fridge and re-whip it. This was so-so for me. I used dairy milk and ran out of vanilla extract, that probably affected the results. I don’t have a food processor, so I used the blender – it works fine, but takes longer because you have to scrape down the sides frequently. I didn’t like it enough to serve to guests, but I might make it again for myself if I’m having a flare-up and need super friendly foods. Is it possible to substitute stevia instead of honey? Or is the thickness of honey part of what gives it it’s form? I’ve been following the AIP diet for about 3 months. My weekly treat before starting AIP was ice cream. I’ve tried several different coconut milk ice cream recipes and well, none of them have hit the spot. I just made your recipe and LOVE it! After 3 months of trying to find a dessert I can get into on this diet, I am ecstatic to find this one. Ice cream like, filling, low carb/sugars, with healthy gelatin. Thank you!